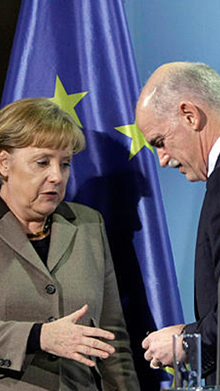 German Chancellor Angela Merkel (left) meets with Greek Prime Minister George Papandreou in Berlin for talks for a potential debt bailout for Greece. The on-going nature of the euro crisis means Germany is in as much trouble as France and Italy, despite its reputation as the stable, economic ‘powerhaus’ of Europe. This is a point brought home when you consider the ‘euro convergence’ or so-called ‘Maastricht’ criteria. Formed when the Eurozone concept was first coming into fruition, the Maastricht criteria must be met by European Union member states wishing to adopt the euro currency. Taking a peek at which European nations are overdrawn past the limit set out by the criteria and by how much nets interesting results. Italy is a massive 1 trillion euros over the limit, for instance. France is 624 billion over, and wait… ‘sensible’ Germany is 607 billion over its overdraft limit, too. Debt levels are unsustainable yet the collapse of the euro would destroy the carefully constructed framework of ‘market socialist’ Europe for good. The authorities will therefore do everything possible to save it. Clearly, it would be unfair for Germany to underwrite the whole of Europe. However, if everyone was to throw their debts beyond the Maastricht limit into a ‘Euro Tera-bond’, the numbers look much fairer. Teetering Spain for example only need put 111 billion into the issue to be back into good shape, less than 20% of what Germany needs to get back on track. The amount France would share of the bond would be about the same as Germany’s, which optically looks fair, even though France’s economy is only two thirds the size of Germany’s. With this mechanism, four trillion of sovereign debt could be hoovered out of the banking system of Europe into a jointly guaranteed bond. This would bail out the periphery and core of Europe, refinancing the whole zone. This might sound like madness but it would leave Europe with lower debt ratios than the US – i.e. 91% of GDP to debt ratio against 105% in the US. Forty one percent of the Eurozone’s debts would be in Eurobonds with around 50% in local sovereign debt, giving members total headroom of 10% below the Maastricht criteria and a similar advantage of being well under the indebtedness ratios of the US. It also brings the European Central Bank (ECB) one step closer to a Federal - like institution, clearly another step towards the likely Federal unification of Europe – the ‘United States of Europe’ that is often talked about. If the euro is to survive, this is the sort of structure that will end the saga. When and if this happen will be clear by the autumn.